Nicklas Lundblad had barely written his article ”File sharing has created a new public sphere” (in Swedish daily Svenska Dagbladet, March 9) arguing that those who provide network access should not be made responsible for the content of the networks, as the copyright industry demands, when the Swedish service provider Bahnhof was hit by a police raid, and their servers were confiscated. For a person knowledgeable in media history, this must be regarded as quite an extreme measure, reminiscent of Paris in 1777, when a law was passed that gave each holder of a printer’s privilege the right to apprehend the nearest police commissaire and bring him to inspect bookstores or printers, where pirated editions might be expected – and also sequester ”counterfeit copies”. 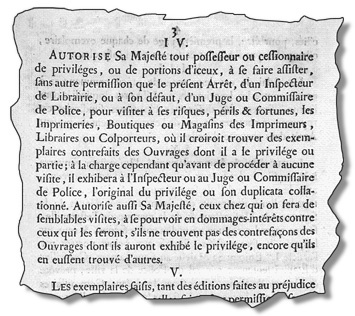 ”Arrêt Du Conseil D’état Du Roi, Concernant les Contrefaçons des Livres” (Royal Decree Regarding Counterfeits of Books) from August 30, 1777, article IV. The emergence of new media has always changed the balance between the private and the public. Angelo Poliziano of Florence said already in the 1400s about the printing press that ”the most stupid ideas can now in a moment be transferred into a thousand volumes and spread abroad.” In Venice in 1517 so many printers had been granted privileges that nobody no longer knew who had the rights to what. The authorities were forced to withdraw all privileges and make all literary works free. In 1525 Martin Luther suffered the fate that many film companies today experience – their works are sold publicly as pirated copies before they are published legally. Luther’s Fastenpostille was thus stolen in manuscript form in Wittenberg and then printed in Nuremberg. The only reasonable strategy for legislation, when a copyright law finally was passed in England in 1710, was to focus it on the author, the only constant of a literary work. I am quite convinced that we eventually, also with today’s media, will find a way to regulate intellectual ownership so that legislation balances opposing interests well. However, during an interim period we will see excess and exaggeration from all parties involved. Lundblad mentions the new kind of public sphere that has emerged on the networks. And this is very true, but not just there. I often say, that all of our old and new media, together with the people who use them, constitute a public hypersphere (in Swedish: hyperoffentlighet) , which differs radically from the bourgeois public sphere (bürgerliche Öffentlichkeit) that Habermas described in 1962, with its roots in the French Revolution and the Central European café culture. The English translation, public hypersphere, is actually a better expression for this concept than the Swedish, since it shows that it is not just public or transparent to a higher degree than the regular public sphere; it has a whole new structure. 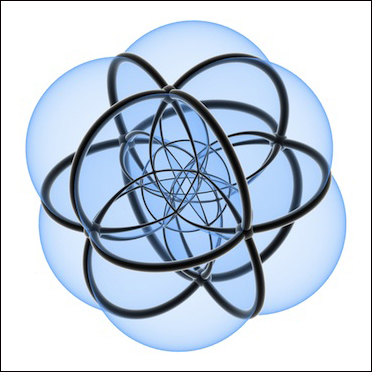 Mathematicians talk about hyperspheres when they want to describe a sphere of higher dimensionality, where normal geometric rules don’t apply – here, the shortest path between two points is not necessarily a straight line. What is published in one country on the web, is simultaneously accessible in all other countries and time zones. A connected person is in the middle of everything, but so are all of the other people who are connected. Bilateral email easily becomes multilateral, when one is forwarding or sending copies or blind copies to friends and contacts. Suppose one of the secret recipients of a mail is, for instance, a professor at some Swedish university – the mail in question will all of a sudden become a public document, which might be requested by any citizen. Payments through credit cards, GPS navigation, multimedia messaging, webcams, interception by Echelon, blogs, peer-to-peer sharing, and lots of other phenomena imply that we today live in a public hypersphere, which resembles author Robert Heinlein’s four-dimensional house in his story ”And He Built A Crooked House”. In that house one might enter a room and suddenly get a glimpse of oneself from behind. Something similar happened when I, in my capacity as editor, one day through email was offered to buy my own slightly distorted article text from some completely unknown person in South Africa. We monitor and are monitored. The electronic traces we leave constantly write our autobiographies. Legislators can not keep up. If we wish to be left in peace (remain ”unpublished”), we ourselves must seek out areas without connectivity. Otherwise we become ”goldfish in the privacy of bowls”, as Cole Porter put it. The public hypersphere twists the public sphere an extra turn; it is not a forum or a coffee house but an ether, a gas that fills the entire available space, it is ”the place that doesn’t exist”. Yet it is a realm where fruitful meetings as well as disturbing intrusions occur. For better or for worse, it mirrors all sides of us who dwell there. To the start page of this blog.